Do you take lots of photos when you are out and about? Inspirations for patchwork and quilting are all around us, if you keep your eyes open. If you are not confident, or do not have the time to draw what you see at the time, then you can use your camera, or phone, to record the image. 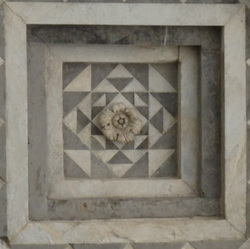 Look down at the floor tiles or pattern of cobbles and decorative paths and up to the walls for carvings in stone or wood. 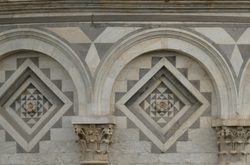 You might be thinking ‘Yes, that’s fine – but where or how do I start creating my design.’ Look closely at the photo I took in Italy of a pattern on a stone building – wouldn’t that make a great patchwork quilt? There are no colours to distract, just lights and darks, so the choice, when deciding on colours, would be yours. To create a pattern you would need squared paper, obtainable in any stationers. 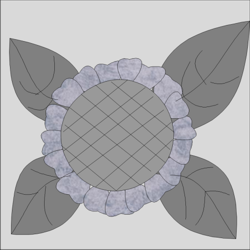 Study the photograph and you will see it could be a 20” square made up of four 5” squares (across and down), with a lovely tudor rose appliqued in the centre. 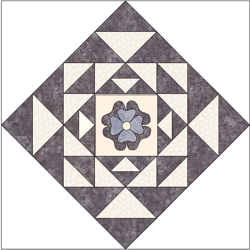 You could then tip the block on point and add the required borders, and maybe finally design a lovely applique for each corner that compliments the centre. A lot of fun can be had playing with design and pattern on squared paper. Don’t forget to fill in the dark parts to create the contrast! 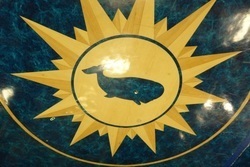 There is a lovely pattern for a cushion with a beautiful padded centre to the sunflower on the picture I took of a wall in China, and the whale in a sunburst from the floor of the boat I was on going to Elba is just crying out for stitch and flip paper piecing (to keep those points in order and nice and sharp!). The final photo was taken in China of a window – reminded me of sashiko – a quilt/wallhanging of different patterns in a circle perhaps? Costumes are a good source of ideas, taking a small area and enlarging it or taking inspiration from the combination of colours. Patterns can be simplified. Rotated, repeated or staggered and then copied on tracing paper and enlarged on a photocopier or on graph paper. I hope I have inspired you to keep your camera handy when out and about and/or on holiday. Quilts, whether they be small wall hangings or huge bed quilts, can make such wonderful memories.